Caribbean cruise departing Miami: Enjoy a fantastic 2 night stay in Miami, then embark on an epic 10 night, full board cruise aboard Holland America’s Koningsdam around the Caribbean. 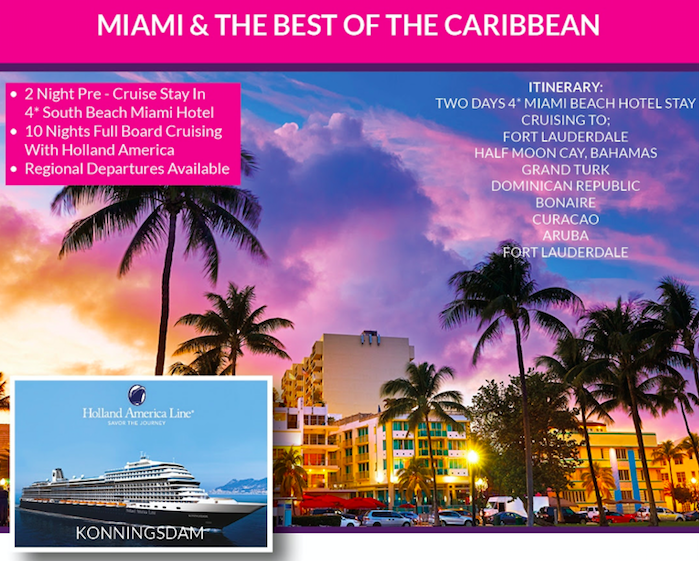 Departing and returning to Miami, ports of call include Fort Lauderdale, Half Moon Cay, Bahamas, Grand Turk, Dominican Republic, Bonaire, Curacao & Aruba. With a 2,650-passenger capacity the Koningsdam combines 21st century elegance and nautical tradition. Inspired by music, her design features fluid lines, light-filled spaces and innovative, world-class entertainment, and restaurants you’ll want to come back to again and again. We make holidays easy, save time and book with confidence. Contact us about this fantastic cruise on 0800 810 8404 or send an enquiry below.